1/8" Thick x 36" Width Red SBR Sheet | U.S. Plastic Corp.
Weighs 158 Lbs. per 50' roll. Red SBR Sheet has Good physical properties (Properties shown based on Rubber Manufacturers Association Sheet Rubber Handbook, second edition). 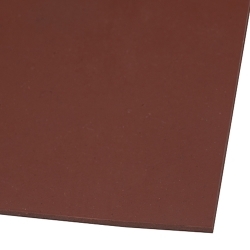 This commercial grade red SBR sheet has a 70 durometer hardness (Shore A). Tolerance on the durometer is +/- 5. The common name of this Styrene-Butadiene is Red Rubber Sheet and the ISO/ASTM Designation is SBR (meets D1330 Grade 1). Also meets ASTM specification (SI units) D 2000 M1AA 705. Temperature range is -22°F to 158°F. Tensile strength is 600 psi and elongation is 200%. This sheet has a plate finish. Sold in full rolls only.